i'd be remiss if i didn't point out that the hakkalugi black lung wasn't essentially the same as the ibis i reviewed just over a years ago, except that was painted a lime green that has become an acquired taste over the past fifteen months or so. this colour scheme is rather humorously named phlegmish green a portent underlined by the positioning of something remarkably similar to the lion of flanders on the seat tube. the model under test, despite an almost total absence of paint, is also heir to more humour regarding such a striking finish. black lung is a pictorial euphemism for the matt black stealth that all but envelopes the carbon monocoque. 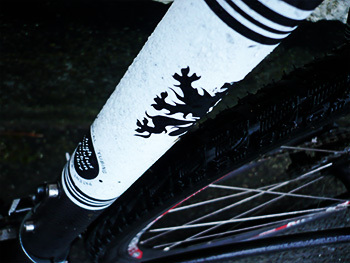 aside from the lion of flanders decal on the seat tube, and a shiny clearcoat ibis decal on the substantially proportioned down tube, the remainder of the bike is completely invisible to enemy radar. though the cycle is described as a cyclocross bike, and will indeed fulfil that function admirably, the existence of double bottle cage bosses is something of a pointer to its rather more wide-ranging versatility. to a certain extent, this is also underlined by the choice of rubber on the easton wheels. 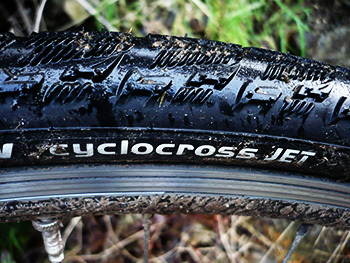 michelin cyclocross jet tyres can mix it with the best of them offroad, provided the ground has not veered too far towards a sloppy consistency. the tread pattern is tight and tactile, leaving very little room for mud clearance; however, the very same tread provides remarkably little rolling resistance on tarmac. perhaps the most notable difference between the phlegmish ibis and the stealth version is the replacement of the now discontinued alpha carbon fork with one from enve. 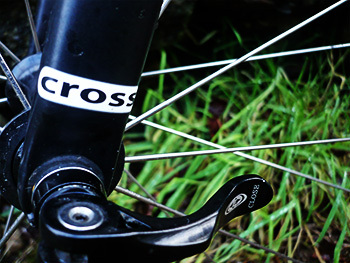 mysteriously, the review model had both fork legs badged edge from the days before enve had an enforced name change. 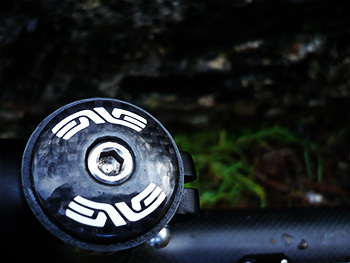 just to add to the confusion, the carbon stem cap did, in fact, say enve. i can find nothing in print to confirm my close observation, but it does appear that the tabbed dropouts on these are also made from carbon. with a carbon steerer, there's precious little metal invading the fibres. ibis uk offers two build kits for the hakkalugi, irrespective of colour choice, one featuring shimano's ultegra groupset, the alternative being sram force. i rode the latter, this time paired with a sram carbon cross chainset (the phlegmish bike has an fsa alloy). choose the shimano version and you get a 34 inner tooth coupled with an 11 sprocket at the rear. the sram version is 50/36 with a more practical (to my mind) 12 tooth out back. all this carbon adds up to a very light bicycle, even on the 55cm model tested this time round. if i'm allowed to own up in public, this frame was just a smidgeon too large if i intended carving a career as a cyclocross racer, but ideally sized for a bit of everything. the current sram build kit shows sram shorty cantilevers as the stopping option, but the review model sported some black (what else?) trp cantilevers. the headset is a 1.125" cane creek is3i semi integrated model. 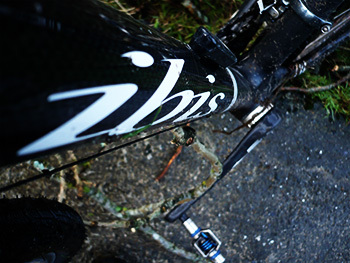 bars and stem are ibis badged 7075 forged alloy. 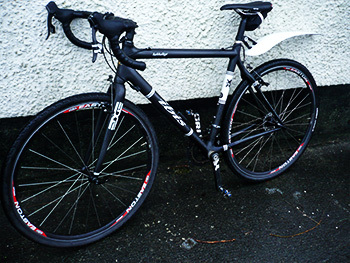 those bars were clothed in black lizard skin bar tape, not quite shiny, but very grippy. one huge point in the hakkalugi's favour is not only an iconic logo, but one that has been crafted into a 'real' head tube badge. this is reinforced with another touch of scot nicol's humour via the rear cantilever cable stop resembling a clenched fist. 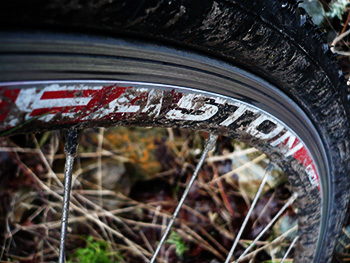 the easton wheels are nothing special, but this is hardly a vote of disfavour; with such incredibly built, conceived and priced wheels on the market today, nothing special generally equates to a rather excellent pair of wheels. for sitting your bum on there is a sleek wilderness trail bikes rocket v saddle, bolted on top of an ibis 7075 alloy seat post. having already paid tribute to the incredible lightness of being sported by the hakkalugi, it may be obvious to see that there is great potential to lighten the bicycle even further by replacing key components, should you be of such persuasion. as review bikes rarely arrive fettled with pedals, i fitted a pair of crank bros. eggbeater 3s, coincidentally also distributed in the uk by the same company as distributes ibis cycles. it's the second time of riding an ibis hakkalugi, and though certain key components have been replaced, it would be a valueless claim to say a lot has changed. however, what did change this time round was the use to which it was put. 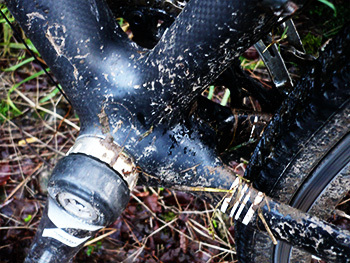 over the past year, frequent visits to bridgend woods have resulted in a very satisfactory cyclocross course involving smooth, bumpy, muddy bits coupled with running uphill bits, falling off into tree trunk bits and a park bench that allows for appropriate rest in between flailing myself to a pulp. i know it can cope masterfully with such terrain, and you know that it can cope with such terrain, but how well does it fulfil its alternative role as general all-round good egg? as a somewhat lightweight cyclist, in every sense of that phrase, i thought it unlikely that i would ever trouble the ibis to within several metres of its true, aggressive personality, aggravated in this case by its matt black presence. as already mentioned, those michelin tyres proved themselves more than the equal of islay's deteriorating roads, and were pressed into a form of service that was likely kept secret from them when resident in the michelin factory. though my early days with the black lung were employed surveying the estates in gentle fashion, such couch potatoeness was not to last forever. the period of review coincided with my attempt on the 2011 rapha festive 500; never has an occasion of serendipity been so serendipitous. on discovering a cracked chain on my chris king cielo, i attached a crudproducts raceguard to protect my back, a rapha saddle pack should mechanicals be suffered and headed out into some of the worst conditions it has been my misfortune in which to ride (and i loved every minute of it). despite serious gale-force winds and shot-peening hail, the hakkalugi's stability was a marvel to behold. though it seems a tad humorous to state that it's as well one of us knew where we were going, the black carbon encouraged delegation to its keener sense of direction, ensuring that i always returned home in timely fashion. i'm laying some of the credit squarely on those enve forks. copious amounts of precipitation rendered each day's cycling apparel dripping wet, forcing a need to wear a different pair of gloves on each occasion. despite such a variation in potential grip, the lizard skin tape clung to everything. i can honestly relate that my hands never once unintentionally left the ibis bars. impressive stuff and such an inspired name. if the ibis figured the old year was bad, the influx of hurricane force winds when only a day or two into the new year surely made it reconsider its holiday plans. however, the steadfast surefootedness became less a feature and more a necessity when navigating roads strewn with seaweed, rocks, tree trunks and many an unidentified, but seemingly immoveable object. the michelins did not like sodden grass at all, often spinning uselessly inder pressure from the 36/28 combination, but when clambering over stuff that would scare sven nys, the whole package was a pleasure to ride. none of this is to detract from the black lung's eminent suitability for the cyclocross circuit, but with few, if any 'cross races left for this year, what would you otherwise do with that hakkalugi in the bike shed? i think the above has appropriately and convincingly answered that question. perhaps a retail cost of £3175 ($3017) might be considered a rather hefty price to pay for versatility, and considered in such an unemotional manner it's hard to argue. but factor in the exceptionally high level of fun and joy that accompanies ownership, you'd be more likely congratulating yourselves on having acquired such a bargain. even california probably has laws against this degree of fun. ibis cycles are distributed in the uk by edinburgh's 2pure, and thanks to them for the extended loan of the review model. if you're in north america, the build kit options are between ultegra and sram rival with detail differences from those described above. however, you can purchase either colour of hakkalugi as a frame and add whatever you like.